PennWest can help you find the right aerial or scissor lift today! Absolute E-ZUp Aerial lifts and AICHI Scissor lifts are designed for reliability, easy operation, convenient service and uncompromising safety. We believe our job is to lift your business. From scissor lifts and aerial lifts to telescopic and articulating booms, you can count on these lifts to help improve your bottom line. Absolute E-Z Up: Safe Productivity. Aichi Scissor Lifts: Many jobs. One solution. 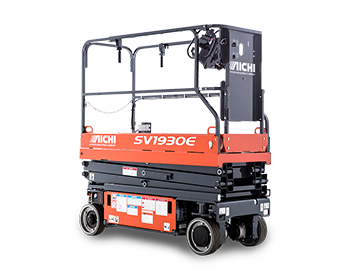 Standard features of the Aichi Scissor Lift help meet operators’ safety needs. 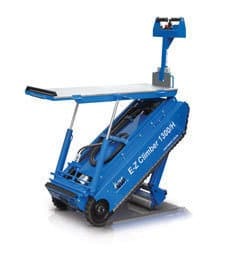 Pothole protectors reduce ground clearance of the scissor lift and limit unwanted movement if the vehicle is driven into a hole while the platform is elevated. An anti-rollback function keeps the lift in place if stopped on a ramp, and controlled descent automatically slows the unit down when travelling down a grade. 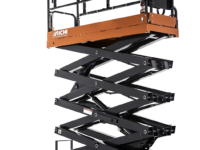 All AICHI scissor lifts also come standard with a tilt alarm, drive and lift cut out, and reduced travel speed when the platform is elevated to further promote your operator’s safety.